March 1, 2015 | To Health With That! What is an Antioxidant And Do I Need to Take One? Clearly this is an important issue and everyone tosses around the word antioxidant like they know what’s going on, but what is an antioxidant really? To start, let’s look at the basics – like what is oxidation? What is an antioxidant? It’s what stops this from happening. The apple browning is oxidation at work. 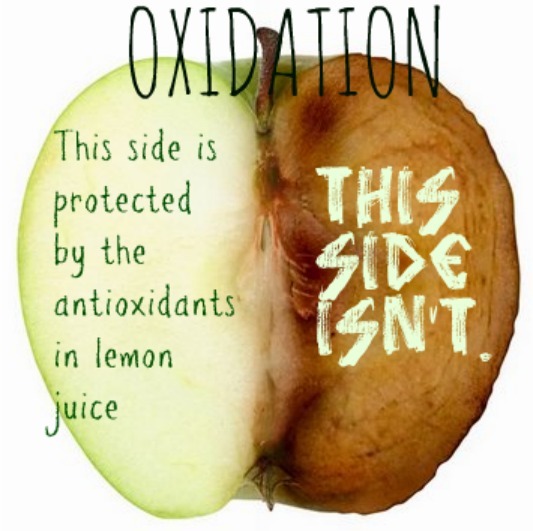 If you’re taking ANTI-oxidants, then it seems safe to assume that oxidation is bad, right? Actually oxidation is an absolutely normal part of life – it happens constantly as a byproduct of using oxygen for so many functions in our body. Each and every cell in your body maintains a delicate balance between reactive oxygen species (free radicals) which cause oxidation and the antioxidants which neutralize oxidation. In the process of metabolizing oxygen, a tiny percentage of the cells and molecules involved will suffer some damage and become free radicals. When asking what is an antioxidant, we need to first know what a free radical is and why it’s important to neutralize them. What is a Free Radical? Essentially it’s an Electron Thief. Free radicals and other reactive oxygen species are by-products of many reactions in your cells including your most vital energy producer called “oxidative phosphorylation.” As you may have guessed by the word “oxidative” in the title, this reaction uses these reactive oxygen molecules to create the most potent energy source for your cells. In addition to normal metabolism, free radicals can also be created by some disease processes and by your immune cells to help kill invading bacteria and viruses. Free radicals are substances that are missing a critical molecule (an electron, to be precise) so they are always looking to steal electrons from other things. Problems arise when they start stealing electrons from things like DNA, thereby creating the seed for disease. What is an Antioxidant and How Does It Help? Very simply, antioxidants are electron donors. They can replace the electrons on your cells that are stolen by free radicals or donate electrons to help neutralize free radicals. They are the Mother Theresa of your internal world – always giving, giving, giving. As a part of the grand design (what I like to call the Great Mystery) there are literally thousands of different antioxidants in natural foods like fruits, veggies, whole grains, nuts and legumes. Antioxidants include the usual vitamins – vitamin A, C, E, D and K but also all of the flavenoids, pigments, and complex molecules that come from whole foods. Remarkably, different antioxidants seem to have an affinity for different tissues of your body so the bigger variety, the better. What Happens If You Don’t Have Enough Antioxidants? When this system gets out of balance is when we start to see harmful changes that can lead to disease. For example, when LDL (“bad” cholesterol) becomes oxidized, meaning a free radical stole one of it’s electrons, then it starts to form plaques in our arteries, which can lead to atherosclerosis and heart disease. LDL itself doesn’t do anything to form plaque, but when a free radical steals an electron from it then it begins to cause harm. Oxidative stress is also thought to be a factor in diseases such as Parkinson’s, Alzheimer’s, Lou Gherig’s disease, and Huntington’s as well as chronic fatigue syndrome and potentially even the genetic damage that can cause a cell to become cancerous. Not only that, but oxidative stress is thought to be one of the major factors in aging, or at least that is one theory. In general your body keeps balance really well – you have lots of overlapping systems to counteract this oxidative stress. In a natural diet you get lots of antioxidants from the plant-based foods you eat, so that’s one more layer of protection. The system becomes overwhelmed when your diet starts to get over-processed or when the stressor pile up including: toxins, alcohol, tobacco, mental and emotional stress, sleep deprivation and chronic infections. Taking a look at the real world, it’s easy to see we’re all exposed to toxins constantly – after all, we all breathe dirty air and drink polluted water. Most people drink some alcohol or come in contact with tobacco occasionally and I don’t know anyone with a perfectly clean diet (myself included). Also, realistically, I don’t know any living human who doesn’t have a high level of mental and emotional stress – that seems to be a condition of modern life. This is when lifestyle changes and possibly antioxidants can help to maintain that balance. It is clear that balance needs to be maintained, but it isn’t totally clear how to best maintain that balance – simply because it has to be a balance. Too much of a good thing, in this case, can cause harm too. Essentially, when there are too many antioxidants floating around, we get the opposite to oxidative stress, which is “reductive stress” (nothing is ever simple with our bodies – nothing.) So that means that there are all kinds of molecules with extra electrons floating around and nothing to do with them, so they start giving them to other molecules that are better off without them. Keep in mind this is the ridiculously oversimplified version of this problem, but it’s the easiest way to make it understandable. To Take Antioxidants or Not To Take Antioxidants? This entry was posted in Healthy Aging, Natural Health and tagged antioxidant overview, best antioxidant foods, food sources of antioxidants, free radical, oxidative stress, what is an antioxidant on March 31, 2015 by amyneuzil. I try to usually go for my own content, but I was so enchanted by the awesome guide to spices from cooksmart that I had to share it with you. Cooking, especially if you’re new at it, can be totally mysterious – like alchemy or witchcraft (or chemistry, if you felt about it the way I did). You add things to a pot in the right order and at some mysterious moment it changes into food and the trickiest of all of those things happens to be the spices. After all, the difference between too runny mashed potatoes and the joy of Vichy sois (a french potato-leek soup) is pretty much all about the spices. One is an epic fail and the other is unforgettably delicious – which is where this great guide to spices comes in. Awesome guide to spices from Stephanie Pando at Cook Smarts. This can totally help when you really don’t know what flavor to add to what. Remember too your spices are often adding a tremendous amount of antioxidants, anti-inflammatory and nutritional value to dishes so generally the more seasonings the better! Perhaps I’ll come up with a guide to spices for health because there are so many documented health benefits for each one. Turmeric, ginger and garlic are some of the best anti-inflammatories in the world and rosemary and oregano both have compounds that boost immune response and help fight off foreign invaders. Even a spice you might associate with sweets and treats and only unhealthy food like cinnamon is actually tremendously helpful in controlling and regulating blood sugar. Herbs and spices add tremendous benefits in flavor, in color and in health to any meal so starting to use them or use a wider variety can be a great step forward for both your health and your taste buds. Hopefully if you’re stuck in a food-rut, as I often am, using this great guide to spices will help shake up the menu and add a little pizazz to dinner. This entry was posted in Food Source, Nutrition and tagged guide to spices, herbs and spices, spice and meat pairings, spices and health, spices and their uses, spices for health on March 24, 2015 by amyneuzil. 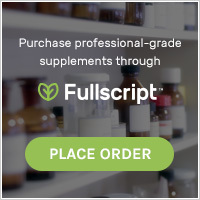 Is the gallbladder cleanse safe for gallbladder sludge and stones? I hear questions all the time about cleanses – especially is the gallbladder cleanse safe for people with sludge and stones? The answer, as usual, is *sometimes*. Let’s go over the cleanse, the effects and results, what to expect and also who it is and isn’t safe for because it certainly isn’t safe for everyone and the gallbladder cleanse does have some risks. For other options for gallbladder sludge and stones there is a detailed post on that here. Also, for anyone considering the gallbladder cleanse, please read Ian’s comment below. He had a 6mm stone lodged in a duct that never showed up on ultrasound – how scary is that? Remember, known stones make you not a good candidate for a gallbladder cleanse. First off, it’s best to use some expert guidance to help make the gallbladder cleanse safe for you. I would highly suggest working with a practitioner or at the very least getting a good book that can explain all of this in much more detail. I like The Liver and Gallbladder Miracle Cleanse by Andreaz Moritz. It’s a nice overview of what is going on in your body, and detailed instructions about the cleanse. These directions are taken from that book. This is a great book that will help you to determine is the gallbladder cleanse safe for you as well as to walk you through the steps. 6 days of prep followed by 16 to 20 hours of actual cleansing. malic acid at wine making shops. Use 1 tsp malic acid in 32 oz water instead. 2 pint jars, one with a lid. 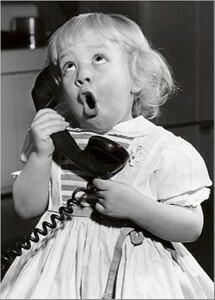 Drink 6 oz of the epsom salts mix now – chase with lemon water to take the taste out of your mouth. It tastes gross and this is the start of your actual cleanse. 9:45 pm: Wash and juice your grapefruits and remove pulp. Mix ¾ glass of juice with ½ glass olive oil in pint jar and shake hard to mix this (vile) brew. 10:00 pm: Drink the oil and juice concoction in one go if you can and immediately lay down. Lay with your head higher than your abdomen or on your right side with knees to chest. Meditate on your liver and try to lie still for 20 minutes – may do castor oil pack at this time as well. Go to sleep if you can. You may need to wake in the night to have bowel movements. In rare cases may experience nausea or vomiting during the night – this can be normal. 10 – 10:30: You may start freshly pressed juice at this time. Half an hour later you can eat light food. By evening or the next morning you can start light food. *in case of nausea, vomiting headache try coffee enema, liver support, hot water with lemon. Putting the question of is the gallbladder cleanse safe aside for the moment, it is clear that it’s not especially pleasant. Anyone who has had any internal experience with Epsom salts can tell you it’s not one easily forgotten. They taste vile and your body clearly rejects them swiftly via horrible, liquid bowel movements. Now – will this clean out your bowels like they’ve never been cleaned? Yes. Yes it will. Again, will you enjoy it? Probably no. The actual cleanse itself is really asking your body to do some serious work. The malic acid in the apple juice is meant to soften up any small stones and help them to pass more easily and the Epsom salts, in addition to flushing the pipes, will also help the bile ducts to dilate and open so that more sludge and stones can pass through. It is not uncommon to experience nausea, vomiting, abdominal discomfort, diarrhea and general ickiness. If you actually had larger stones in the gallbladder then it is also possible to force one into the bile duct and induce a medical crisis – we’ll talk about that more in the Is the Gallbladder Cleanse Safe section. Aside from not feeling terribly well on the actual day of cleansing, many people report feeling fantastic after the cleanse – literally like they have been cleansed or lightened somehow. The bowel movements during the cleanse will often contain bright green residues that area actually bile sludge or tiny stones finally encouraged to come out of the body by the oil and citrus mix. This causes the gallbladder to contract strongly, hopefully purging the entire gallbladder contents into the intestine. This is exactly what you’re after with this cleanse – we want to see these little green residues. It means that either your bile is flowing strongly and was able to rise to the challenge of the oil mixture, or that your gallbladder contracted strongly and discharged old sludge and debris. Either of those options are good. Essentially we’re looking to eliminate a build-up of fat soluble toxins that are bound to the bile and accumulating in the gallbladder in the form of sludge. This will long-term help your overall liver processing, aid your body’s ability to digest fats and generally contribute to well-being. Also if you’ve been having symptoms of gallbladder sludge then this should help to reduce some of those. 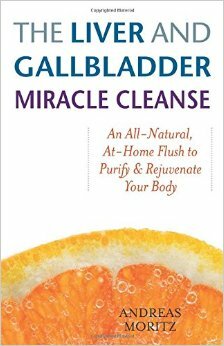 So Is the Gallbladder Cleanse Safe for Gallbladder Sludge and Stones? The most accurate answer to that question, is no. I’ve heard a number of horror stories of people starting the gallbladder cleanse only to push a stone into their ducts and end up having an emergency surgery to remove the gallbladder. Most of the people doing the cleanse were trying to avoid exactly that outcome, so that’s not thrilling. If your gallbladder has sludge but no stones then typically that makes the gallbladder cleanse safe for you. If you actually have stones, then this is probably not a good idea. If you haven’t really been to a doctor and don’t know if you have sludge or stones or just poor digestion, then I honestly wouldn’t suggest it – just because there is a chance you do have stones and could push one that’s a little too big into a place it can’t get out of – hello emergency surgery! 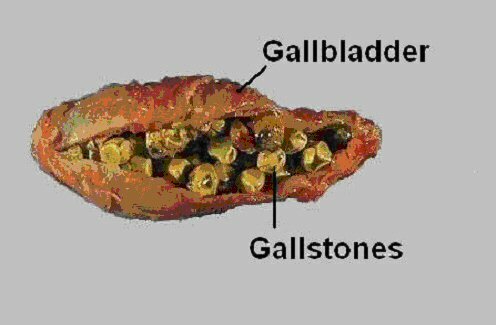 This is a gallbladder with some serious stones – you don’t want to get one of those stuck in your ducts anywhere. I know everyone wants to hear that the cleanse is perfectly safe and harmless, but it isn’t. This is a powerful tool and if it’s used incorrectly it can be harmful or even life-threatening if you can’t get to the ER. There are risks to the gallbladder cleanse and shooting something out of your gallbladder that gets stuck is one of them. Also you have to be prepared for the dehydrating effects of the Epsom salts – the diarrhea they give you can be quite watery and contribute to a severe loss of fluids if you’re not careful to replace them. Outside of that the whole process can be reasonably unpleasant – the diet is great, the apple juice is fine, but the cleanse itself is pretty vivid. That’s not a reason not to do it, it’s just important to be prepared. For some more gentle options for dealing with gallbladder sludge and stones look here, and for help supporting liver function in general look here. The gallbladder cleanse can be a fantastic option with fabulous results, the you have to be sure that you’re a good candidate and that you have enough knowledge to make the gallbladder cleanse safe for you. Also, I want everyone to read Ian’s comment below – he had a stone that didn’t ‘show up on ultrasound, which would have been extremly risky if he had tried the cleanse!! Keep that in mind before you try. This entry was posted in Gallbladder, Natural Health, Nutrition and tagged gallbladder cleanse, gallbladder cleanse risks, gallbladder cleanse safe, gallbladder cleanse safety issues, gallbladder sludge and stones, natural remedies for gallbladder on March 17, 2015 by amyneuzil.